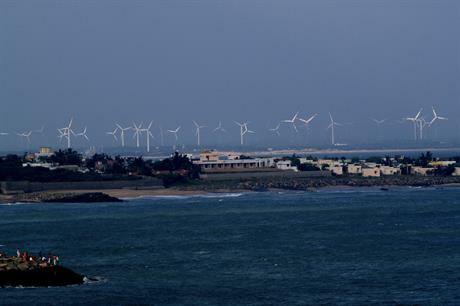 A tender for 500MW of wind power capacity has been issued by the Tamil Nadu Generation and Distribution Corporation (Tangedco). It is the second 500MW tender launched by the state utility, more than a year after the first. The latest round requires a minimum bid size of 25MW and tariff ceiling of INR 2,650/MWh ($38.03/MWh). The bid-submission deadline for the tender is 28 December 2018 and a 25-year power purchase agreement (PPA) will be awarded to the winners. Tangedco had announced its intention to tender 1.5GW of wind and solar each in March 2018. However, it only received approval for tendering from the state regulator recently after modifying tender conditions and power purchase terms including clauses related to payment security, and participation of foreign investors. The last tender in August 2017 saw contracts awarded to three players — Regen Powertech (200MW), Leap Green Energy (250MW) and NLC India (50MW) — for tariffs ranging from INR 3,420-3,450/MWh ($47.89-48.31/MWh).